The return of rent control? An idea that was supposedly buried a generation ago is rising rapidly up the housing policy agenda. A new manifesto for private renters published today highlights the new thinking on housing emerging ahead of the general election. This is the first of two manifestos being launched this week by new organisations with different priorities and constituencies to the existing ones. We’ll hear from SHOUT, the campaign for social housing, tomorrow but today it’s the turn of Generation Rent. And it’s about time. Since the creation of the assured shorthold tenancy and the invention of buy to let, the private rented sector has more than doubled in size. That’s great news for landlords and letting agents but not so great for tenants with minimal security of tenure and consumer rights. To illustrate my point, here are three recent bits of news. Can the votes of private renters swing the next election and move their concerns up the political agenda in the process? The huge shift in housing tenure seen this century suggests they can. 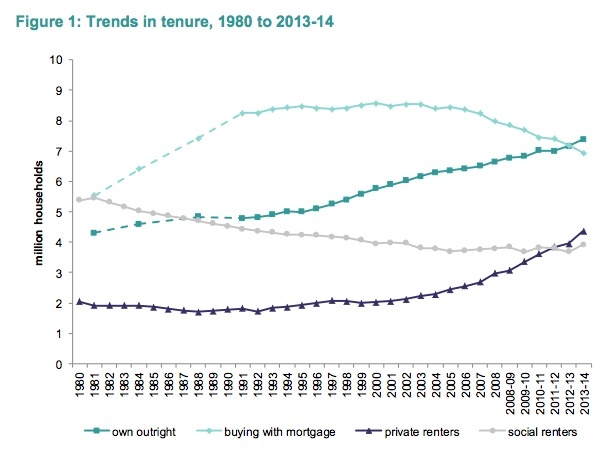 In 2000 just two million households in England were private tenants. According to the English Housing Survey, that had doubled to almost four million by 2012/13. Add another 500,000 in Wales and Scotland, allow for another two years of growth and, with 1.8 people of voting age per household, you have nine million potential private rented votes at the next election. Polling by Generation Rent, the recently relaunched National Private Tenants Organisation, suggests that the votes of private renters could be decisive in 86 seats in England. Of these, 38 are currently held by the Conservatives, 32 by Labour, 15 by the Lib Dems and one by the Greens. The results here could be enough to deliver an overall majority for David Cameron, make Ed Miliband the leader of the largest party or give Nick Clegg a major say in a new coalition.